And, finally, the Voltage Controlled Oscillator PCB! (Two of them, actually!) 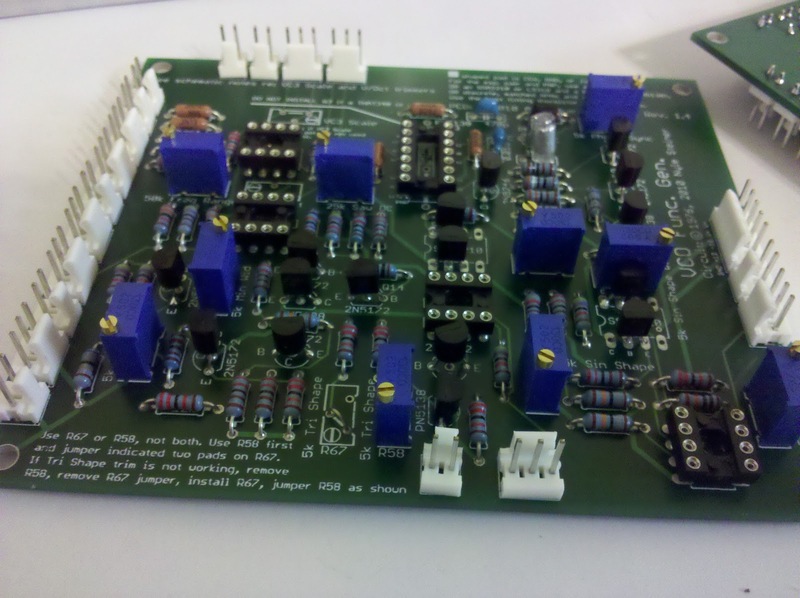 The is the bigger "A" model oscillator in the Synthasystem. Feature-wise it is a pretty typical oscillator and has sine, saw, triangle, and pulse outputs. Each output has an attenuator, which is a bit atypical. There's both coarse and fine controls, along with exponential (1V/Oct) inputs, one of which is attenuated. In addition, there's a sync/reset input, pulse width control, and a pulse width modulation input. You'll notice space for a trimmer up front there: it is actually supposed to be empty. There's two spots next to each other, for the triangle shaper. You're supposed to use the right one, and jumper a pair of (marked) pads on the left one. If the oscillator doesn't perform well, then you're supposed to swap the trimpot and the jumper. Hopefully that won't be necessary! There's a couple other trimpots that have been omitted too. One is the 1V/Oct calibration, which I'm instead moving to the front panel as one of the panel-mount trimpots (there's an MTA header for it, so no flying wires from pads in the middle of the PCB). The other is for the scale of the 3rd VC input. There's a few options for this: I've opted to use a 200k pot on the front panel (it is a feature I like), but you could use the trimpot, the panel-mount trimpot (again, there's an MTA header), or make it a fixed scale! There's an associated scaling resistor... for my 200k pot, I'm using a 22k resistor (as suggested in the BOM) - it would be the same for any equivalent trimpot. If you're using a fixed scale, choose the resistor and then jumper two of the marked pads under the trimpot.